many commercial customers reformulated their products to use fewer eggs when prices spiked, and have been slow to resume previous egg usage. Specialty eggs, excluding co-pack sales, accounted for 22.4 percent of our total sales volume for the second quarter of fiscal 2017, the same level as the previous-year period. Specialty eggs revenue was 45.8 percent of total revenues, compared with 26.1 percent for the second quarter of fiscal 2016. Specialty egg prices have typically been less volatile than conventional eggs, which proved to be the case in the second quarter, as the average selling price for specialty eggs was down 13.2 percent over the second quarter of last year, while the average selling price for non-specialty eggs was down 64.9 percent over the prior-year period. Our feed costs per dozen were down 7.7 percent compared with a year ago. Our overall farm production costs were slightly lower than the second quarter of fiscal 2016, even with higher capital expenditures for conversion and other improvement projects. 2/11/2016 Cal-Maine Foods, Inc. (NASDAQ: CALM) today announced that it has closed the previously announced acquisition of substantially all of the assets of Foodonics International, Inc. and its related entities doing business as Dixie Egg Company, relating to their commercial production, processing, distribution and sale of shell eggs business. The acquired assets include commercial egg production and processing facilities with capacity for approximately 1.6 million laying hens and related feed production, milling and distribution facilities in Georgia, Alabama and Florida, as well as contract grower arrangements for an additional 1.5 million laying hens. With the completion of this transaction, Cal-Maine Foods has also acquired the Egg-Land’s Best, Inc. franchise with licensing rights for portions of certain markets in Alabama, Florida and Georgia as well as Puerto Rico, Bahamas and Cuba. the annual average Urner-Barry Southeastern Regional Large Egg Market Price per dozen eggs, for our fiscal 2005-2016 ranged from a low of $0.72 during fiscal 2005 to a high of $2.97 during fiscal 2016. The shell egg industry has traditionally been subject to periods of high profitability followed by periods of significant loss. Shorter term, retail sales of shell eggs historically have been greatest during the fall and winter months and lowest during the summer months. Shell egg prices tend to increase with the start of the school year and are highest prior to holiday periods, particularly Thanksgiving, Christmas, and Easter. Accordingly, our net average selling prices for eggs for the first quarter of fiscal 2017 was $0.952 compared with $2.243 in the fiscal 2016 first quarter. Based on USDA reports, the laying flock is expected to increase through the end of calendar 2016, creating more supply and the potential for further price declines. Changes in market prices for corn and soybean meal, the primary ingredients in the feed we use, result in changes in our cost of goods sold. non-specialty shell egg dozens sold decreased approximately 6.5% and the average selling price decreased 70.7% to $0.638 from $2.174 for the same period of the prior year. specialty shell egg dozens sold decreased approximately 4.5% and the average selling price decreased 20.5% to $1.973 from $2.481 for the same period of the prior year. Mr. Baker is the son-in-law of Fred R. Adams, Jr., our Chairman Emeritus. In fiscal 2016, we sold approximately 1,053.6 million dozen shell eggs, which we believe represented approximately 23% of domestic shell egg consumption. Our total flock of approximately 33.9 million layers and 9.4 million pullets and breeders is the largest in the U.S. In fiscal 2016, specialty shell eggs and co-pack specialty shell eggs represented 29.1% and 2.7% of our shell egg sales dollars, respectively, and accounted for approximately 22.9% and 2.0%, respectively, of our total shell egg volumes. In fiscal 2015, specialty shell eggs and co-pack specialty shell eggs represented 27.2% and 2.8% of our shell egg sales dollars, respectively, and accounted for approximately 19.8% and 2.0%, respectively, of our total shell egg volumes. At December 31, 2015, 56 producers, owning at least one million layers, owned approximately 96% of total industry layers and the ten largest producers owned approximately 50% of total industry layers. We believe industry consolidation will continue and we plan to capitalize on opportunities as they arise. Based on historical consumption trends, demand for shell eggs increases in line with overall population growth, averaging growth of about 1% per year. In 2013 and 2014, consumption of eggs grew approximately 2% per year. However in 2015, egg consumption decreased approximately 4% over the prior year primarily due to a shortage of supply of egg products. According to U.S. Department of Agriculture (“USDA”), annual per capita U.S. consumption varied between 249 and 263 eggs, since 2000. In calendar year 2015, per capita U.S. consumption was estimated to be 253 eggs, or approximately five eggs per person per week. of eggs produced in the U.S., approximately 55% are sold to retail consumers (e.g. through grocery and convenience stores), approximately 31% are sold as egg products (shell eggs broken and sold in liquid, frozen, or dried form) to institutions (e.g. companies producing baked goods), approximately 9% are sold to food service companies and 5% or less are exported. Our sales are predominately to retail consumers; in fiscal 2016 and 2015, approximately 4% and 3% of our net sales was egg products, respectively. As a result of our strategy, our total flock, including pullets, layers and breeders, increased from approximately 33.5 million at May 28, 2011 to approximately 43.3 million as of May 28, 2016. The dozens of shell eggs sold increased from approximately 821.4 million in fiscal 2011 to approximately 1,053.6 million for fiscal 2016. Net sales amounted to $942.0 million in fiscal 2011 compared to net sales of $1,908.7 million in fiscal 2016. For many years, we have pursued a growth strategy focused on the acquisition of existing shell egg production and processing facilities, as well as the construction of new and more efficient facilities. Since the beginning of fiscal 1989, we have completed eighteen acquisitions. Federal antitrust laws require regulatory approval of acquisitions that exceed certain threshold levels of significance, and we are subject to federal and state laws prohibiting anti-competitive conduct. We believe our sales of shell eggs during the last fiscal year represented approximately 23% of domestic shell egg sales, making us the largest producer and distributor of shell eggs in the U.S. However, because the shell egg production and distribution industry is so fragmented, we believe there are many acquisition opportunities available to us that would not be restricted pursuant to antitrust laws. We own breeder and hatchery facilities capable of producing 21.2 million pullet chicks per year in a computer-controlled environment. The shell eggs are processed, graded and packaged predominantly without handling by human hands. Feed cost represents the largest element of our farm egg production cost, ranging from 60% to 69% of total farm production cost in the last five fiscal years. higher feed costs can encourage shell egg producers to reduce production, resulting in higher egg prices. Alternatively, low feed costs can encourage industry overproduction, possibly resulting in lower egg prices. Since shell eggs are perishable, we maintain very low egg inventories, usually consisting of approximately four days of production. Our top ten customers accounted for an aggregate of 70.6%, 67.9%, and 68.5% of net sales dollars for fiscal 2016, 2015, and 2014, respectively. Two customers, Wal-Mart Stores and Sam’s Club, on a combined basis, accounted for 28.9%, 25.7%, and 28.2% of net sales dollars during fiscal 2016, 2015, and 2014, respectively. The production, processing, and distribution of shell eggs is an intensely competitive business, which traditionally has attracted large numbers of producers. 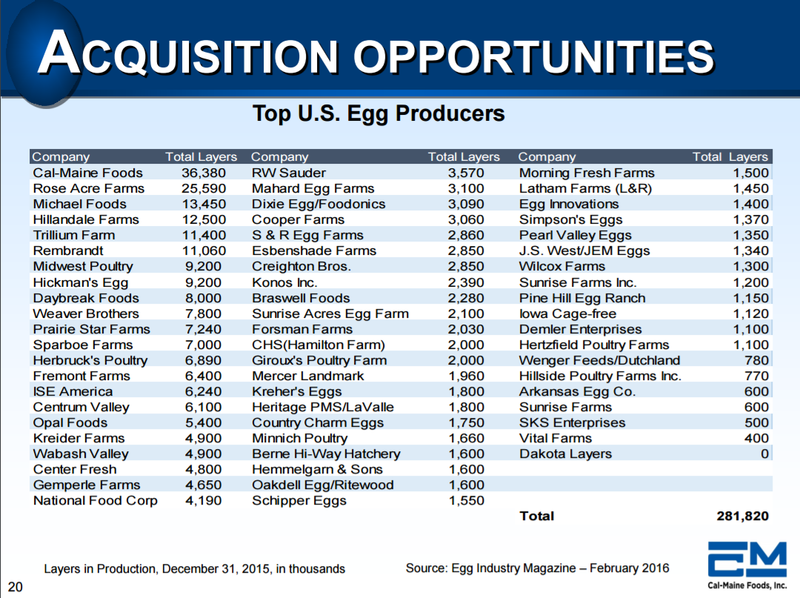 The U.S. shell egg industry remains highly fragmented but is characterized by a growing concentration of producers. In 2015, 56 producers with one million or more layers owned 96% of the 291 million total U.S. layers, compared to 2000, when 63 producers with one million or more layers owned 79% of the 273 million total layers, and 1990, when 56 producers with one million or more layers owned 64% of the 232 million total layers. We believe a continuation of the concentration trend will result in reduced cyclicality of shell egg prices, but no assurance can be given in that regard. A continuation of this trend could also create greater competition among fewer producers. Fred R. Adams, Jr., our Founder and Chairman Emeritus, and his spouse own 27.9% of the outstanding shares of our Common Stock, which has one vote per share. In addition, Mr. Adams and his spouse own 74.7% and his son-in-law, Adolphus B. Baker, our President, Chief Executive Officer and Chairman of the Board, and his spouse own 25.3% of the outstanding shares of our Class A Common Stock, which has ten votes per share. At July 14, 2016, there were approximately 329 record holders of our Common Stock and approximately 63,208 beneficial owners whose shares were held by nominees or broker dealers. Dividend: one-third (1/3) of such quarterly income. The shell egg industry has traditionally been subject to periods of high profitability followed by periods of significant loss. Depreciation expense was $41.4 million, $37.3 million and $33.5 million in fiscal years 2016, 2015 and 2014, respectively. DEFINITION of ‘KSOP’: A qualified retirement plan that combines an employee’s stock ownership plan (ESOP) with a 401(k). Under this type of retirement plan the company will match employee contributions with stock rather than cash. KSOPs benefit companies by reducing expenses that would arise by separately operating an ESOP and 401(k) retirement plans. BREAKING DOWN ‘KSOP’: Using a KSOP is a great option for companies when their shareholders are looking to sell their shares in the company. The KSOP instantly creates a market with sufficient liquidity that is needed for those shareholders wishing to sell their stake. KSOPs also provide added motivation to employees to ensure the profitability of the company. This is because the added profitability would directly enhance their retirement plans.